Grand Circle Travel, a travel company that offers tours designed specifically for mature Americans, publishes 150 catalog promotions a year for over a hundred tour offerings. The company delivers tour information both in print and on the Internet at www.grandcircletravel.com. In the past, production schedules were extremely tight and subject to frequent, last minute changes. Because of the constant need for redistribution of hard copy approvals and input from several departments, time constraints forced late changes to be made by production designers. This made their jobs more complicated and made it difficult to guarantee data accuracy in final publications. What Grand Circle needed was an enterprise application that would join copy editing, photo selection, price approval, and print production processes into a single, cooperative workspace with reliable, easy-to-access data. A MSSQL-based content repository. DPCI structured the database to incorporate all data that is published in Grand Circle's catalogs as well information needed to manage workflow. 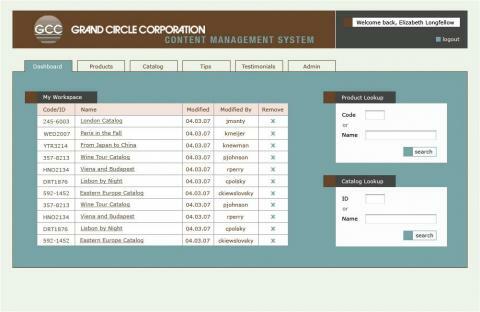 The database provides a single, common information warehouse that all employees use to collaborate toward publishing catalogs. An AJAX-based Web interface within the Microsoft .NET 2.0 framework. The flexible, copy input module allows copywriters to create and edit promotional copy online. Staff can manage all aspects of the copy, including rich-text styling and spell checking. The promotional copy system also implements version control by allowing pick-up and overwrite as well as the automated transformation of copy to other formats (MS Word, for instance). A workflow and permission management management system that generates automatic messages at milestones and allows an administrator to customize user groups according to multiple levels of access across the main areas of the system. Integration with Grand Circle's existing Canto Cumulus Enterprise Digital Asset Management system. This functionality gives the photo department the ability to select images online from within the same system that other Grand Circle departments use. Copywriters access the same module in order to create and edit captions. A set of custom designed MS Excel templates that allow Product Management staff to input price data directly into the MSSQL database. Departure dates can then be selectively published using the content management system. Then, individual price charts are dynamically generated. Automated pre-press file generation. Once all catalog inputs are complete (images, copy text, pricing and trip data) the content management system generates sophisticated QuarkXPress documents using a variety of templates, master pages, QuarkXPress libraries and style sheets. Grand Circle Travel now has an accurate central repository of every single element of data that is needed to market their trips. The implications are indeed grand: Now, not only can the company save time and money in catalog workflow, but mistakes have been virtually eliminated from production. Further, the company can roll out more customized publications in both print and Web formats. DPCI: Building customized multi-channel publishing systems to save our clients money and to create new revenue streams. DPCI’s subject matter expertise helped us to design a scalable publishing solution to meet our ever-changing direct marketing and customer communication needs.